Fresh and healthy Mediterranean flavors easily explained.Sweets, Holidays and Family Recipes presents 34 selected no-fail recipes, inspired by Mediterranean Israeli cooking. The recipes are accompanied by beautiful color photographs, easy explanations and clarifications and step-by-step photos that make the recipes easy to follow.Winner of the Gourmand World Cookbooks Awards (2013).Sweets, Holidays and Family Recipes includes Mediterranean dishes such as Greek Eggplant-pie, meatballs in tomato sauce (with a special Sephardic twist!) and the perfect (classic, but brilliantly simple) chocolate cake that every home cook needs master. It easily explains known Mediterranean cuisine such as and Malabi and delicious almond-cookies, as well as sweet and savory dishes such as potato pancakes (“levivot”), leek patties and zucchini pancakes, suitable for Jewish holidays or any time of year.User-friendly cookbook that will earn a permanent spot in your kitchen.All recipes included in Sweets, Holidays and Family Recipes are Kosher, and most are vegetarian. They all present fresh flavors and exquisite tastes, and include Mediterranean ingredients, such as tahini and fresh vegetables. The book also includes authentic family recipes that have been passed down in the author’s family, as well as her children’s favorites dishes. All the recipes are based on simple techniques and familiar ingredients, and are suitable for weeknight meals, just as for hosting and entertaining.Sweets, Holidays and Family Recipes included:Easy to follow, user-friendly recipesNew cooking tips and techniquesPhoto of every recipe, including many step-by-step photosA treasure trove of 100% kosher recipes! Healthy and delicious home cooking doesn’t need to be time consuming or complicated! 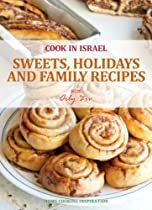 Learn how to cook delicious and healthy Israeli food like a pro, with this award winning cookbook.Get your copy of Sweets, Holidays and Family Recipes now!